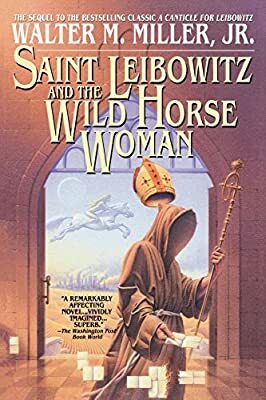 Description: Forty years after the classic A Canticle for Leibowitz, Walter Miller returns to a world struggling to transcend a terrifying legacy of darkness, as one man undertakes an odyssey of adventure and discovery that promises to alter the destiny of humankind . . . .
Isolated in Leibowitz Abbey, Brother Blacktooth St. George suffers a crisis of faith, torn between his vows and his Nomad upbringing, between the Holy Virgin and visions of the Wild Horse Woman of his people. At the brink of disgrace and expulsion from his order, the young monk is championed by a powerful cardinal who has plans for him. Blacktooth sets out on a journey across a landscape still scarred by the long-ago Flame Deluge, a land divided by nature, politics, and war. He will find horrors and wonders, sins of the flesh . . . and love. As he encounters and reencounters a beautiful but forbidden mutant named Ædrea, he begins to wonder: is a she-devil, the Holy Mother, or the Wild Horse Woman herself?